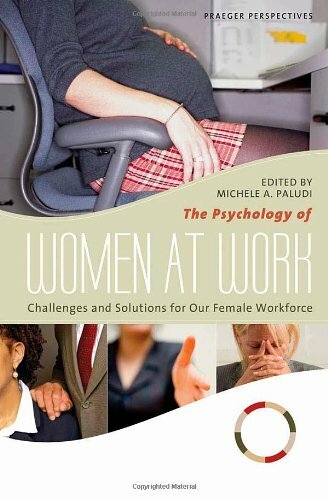 Psychology Of Women At Work (Three Volumes): Challenges: 9780275996772 Hardcover - LIMEROCK BOOKS INC. According to the U.S. Department of Labor, women made up 46.4 percent of the civilian labor force in 2005, and that percentage is expected to reach 47 percent by 2014. Professional and health-related occupations are the fastest-growing roles for women, with computer-related, environmental, and educational fields also drawing increasingly on the female workforce. The bottom line at a macro level is that, more and more, women are driving the country's economic development. But with that phenomenon come questions, challenges, and concerns, on many diverse levels. Debates rage on psychological topics such as the effect the increasing number of women at work has on marriage and divorce, family and children, women's identities and stress levels and, overall, their physical and mental health. Psychologist Michele A. Paludi and her team of experts from across fields examine all aspects of women at work - the pros and cons, how it is changing American society, its women, their relationships, partners, and children. The factors that fuel women achievers are also discussed by female scholars and experts in the field, who illustrate points with vignettes and their own career development stories. Issues in the workplace affecting women's wellbeing are also discussed, including sexual harassment and related laws, pregnancy-related work policy and regulations, challenges for women bosses and career moms, the glass ceiling, racism, women's relationships with male coworkers, and issues that rise when a woman is the breadwinner. This unique and timely set will appeal to those who are interested in psychology, women's studies, education, law, business, and public policy. Examines the benefits and costs of our increasing female workforce, to women, their families and society.